I arrived at Gwalior at the second leg of my trip through the state of Madhya Pradesh. 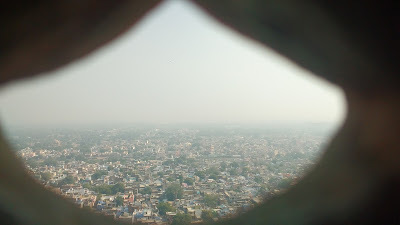 The city, over a period of three days, left a very poor mark on me as a whole - with the air laden with diesel fumes, the narrow roads running a stream of honking mini-tempos and bikes, the debris of construction and signs of decay and the general heaviness of a north-Indian winter smog. 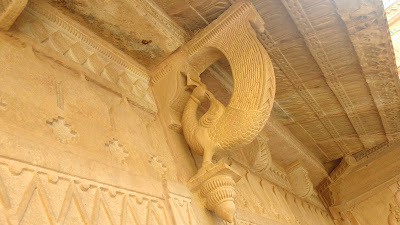 But amidst all these, raised as if on a pedestal, stood the proud fort of Gwalior. This place was different than the city that encircled it. This place was wonderful. 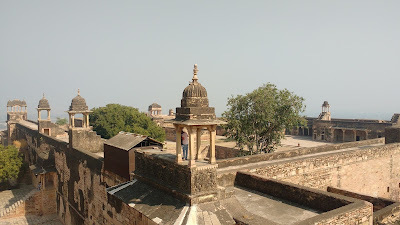 The fort has witness the history of central India being made through the past millennia and more - the Gurjar-Pratiharas, Kacchaphaghatas, Tomars, Mughals and then Marathas (Scindias) ruled over this fort and the territory. The fort stands proud. 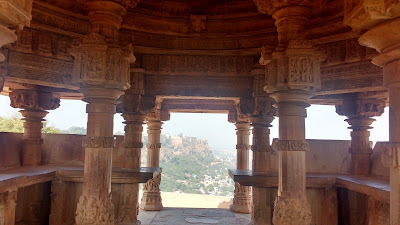 The Gwalior Fort occupies a north-south running hill/plateau. 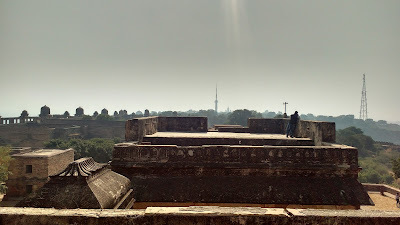 There are two access gates - Urvai Gate to the south-west and Qila Gate to the north. Both the gates have a steep ascent to the top. The Urvai Gate is to be used in case you plan to get a vehicle along. 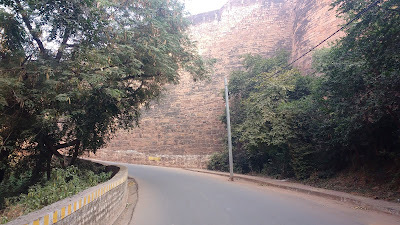 The Qila Gate is strictly for pedestrians. Either of the gates can be accessed easily using public transport - the numbered mini-tempos that run on fixed routes. 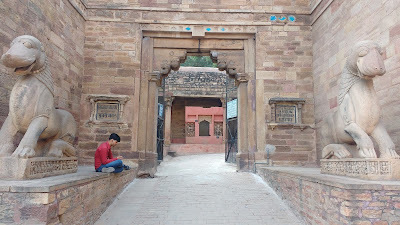 I entered through the Urvai Gate and exited through the Qila Gate, which allowed me to cover Tansen's Tomb after the fort. 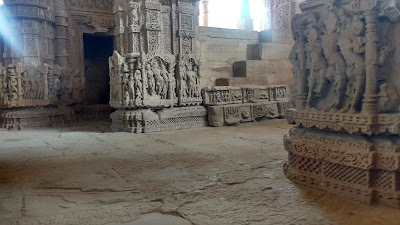 one can choose any way to enter, but note that the tickets to the main monuments - Man Mandir Palace, Sahastrabahu (Saas-Bahu) Temples and Teli Mandir - are sold at a single counter near the Man Singh Palace complex at the centre. 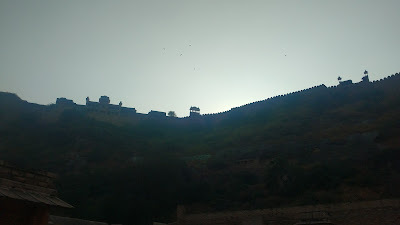 The expanse of the fort can be covered on foot. 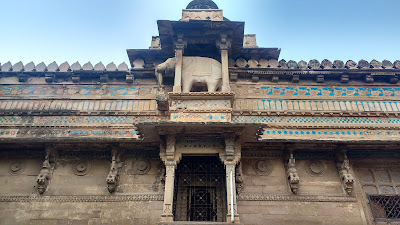 Vehicles are permitted from the Urvai gate to the ticket counter only; this means that the palaces are to be covered on foot while the temples can be accessed by car. 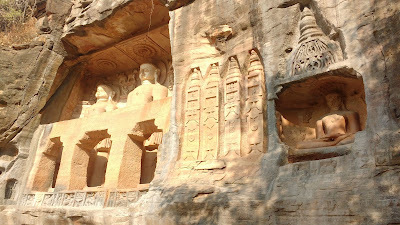 The status of Gwalior as a prominent centre for Jainism is underscored by the numerous sculptures of the Jain Tirthankaras hewn out of the mountain rocks. 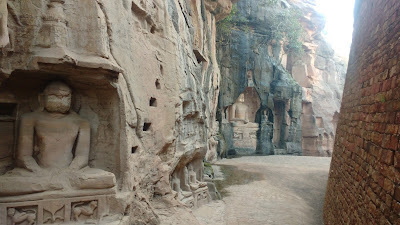 The statues are found at various places along the periphery of the mountain. The prominent among these are the group called Siddhachal along the road that climbs in from the Urvai Gate. Here one can see a continuous line of the twenty-four Tirthankaras of Jainism. 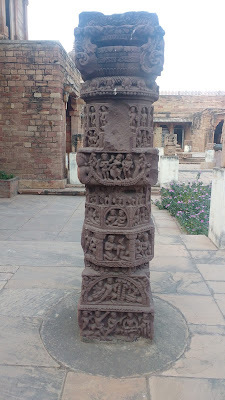 Another set of statues are located just up the road from the Siddhachal group, along a downward staircase. 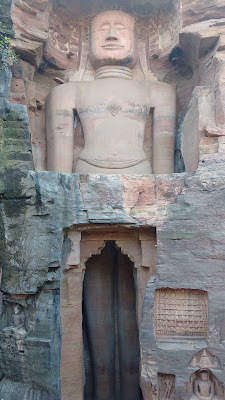 Here one can see a 58ft high statue of Lord Adinatha among others. This location being a little out-of-sight, appears to be a hit among the city youth. 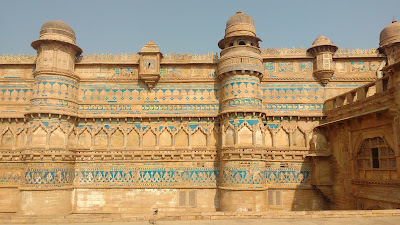 This is the main palace of the Gwalior Fort. 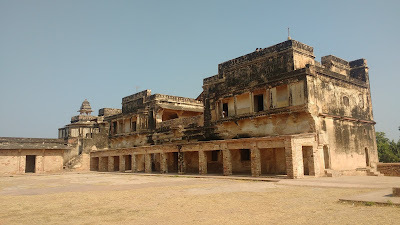 The palace was built in early sixteenth century by the local ruler Man Singh Tomar. The palace has four storeys, out of which two are underground. The ground storey has an access to a courtyard and a few small rooms. 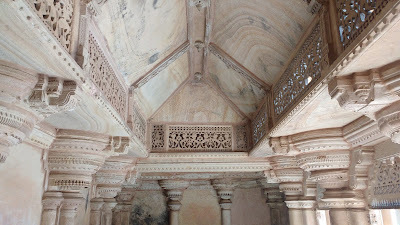 Watch out for the delightful peacock motifs on the pillar brackets and faux patterns on the walls. The underground storeys are accessed by narrow staircases. One can see the entertainment rooms, pools and hanging place in the lower storeys. It is recommended to cover your noses to ward off the stale odour. Only about one-fifth of the palace is open for the general public. 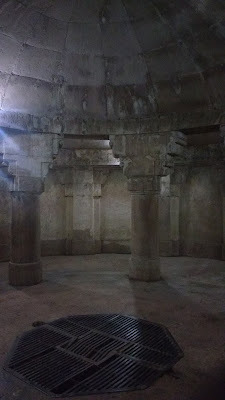 Close by one can also check out the ASI museum, an open hall and a circular tank. 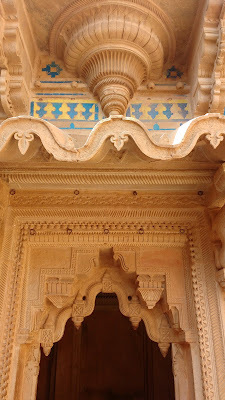 These monuments are located to the north of the Man Mandir Palace and have a separate entry ticket. 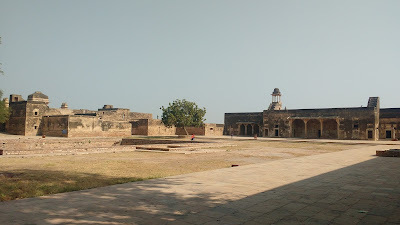 These palaces were built by the eventual rulers of the fort and have a more residential flavour than the defensive structure of the Man Mandir Palace. All these three palaces have chhatris at the higher levels which give a brilliant birds-eye view of the sprawling city below. 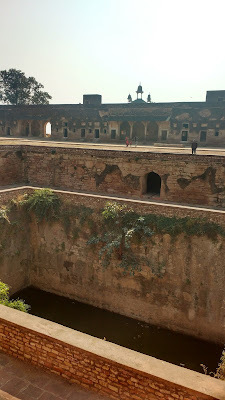 The Jahandir Mahal also has a stepped tank in its huge courtyard. 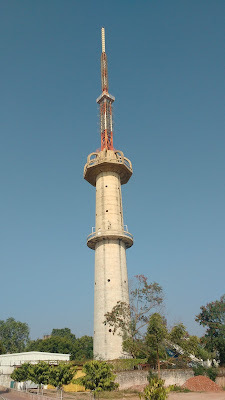 The Bheem Singh Rana Cenotaph is the northern-most of all monuments here. 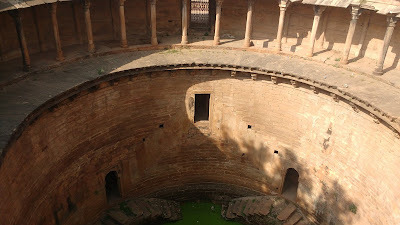 The chhatri is built adjacent to a stepped tank called Bhimtal. 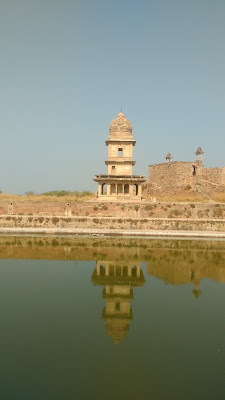 The reflection of the chhatri in the tank waters looks beautiful. 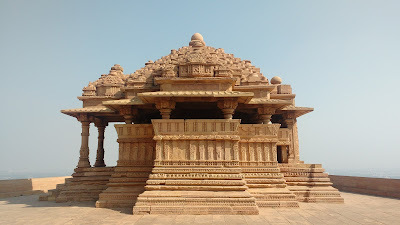 This is a set of two empty temples placed side-by-side. 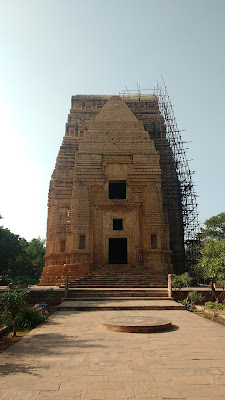 The construction of the temples is attributed to Kings Ratnapala and Mahipala of the Kacchaphagata dynasty, in the early eleventh century. 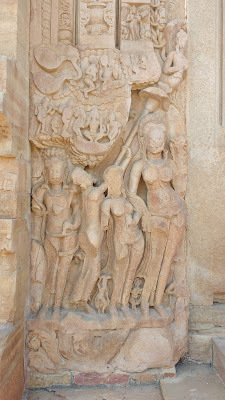 The temple takes its name from the depiction of Lord Vishnu with a thousand arms (sahastra = thousand, bahu = arms). 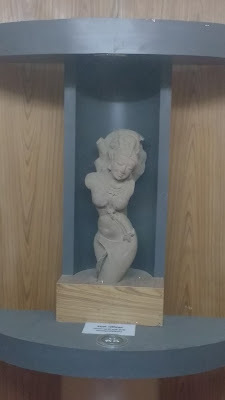 Over a period of time the local misnomer of saas-bahu gained prominence and was used as the primary name. The smaller temple is beautiful yet simple. 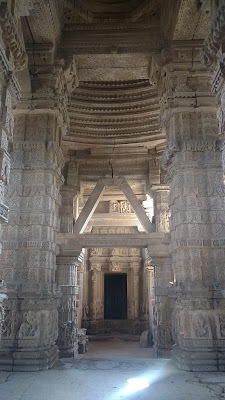 The larger temple features exquisite artistry on the inside in the central hall and o the pillars. 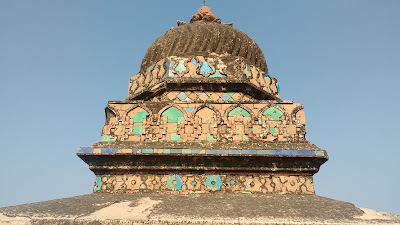 The temples were sacked and defaced with lime (chuna) during the Islamic occupation of the fort. 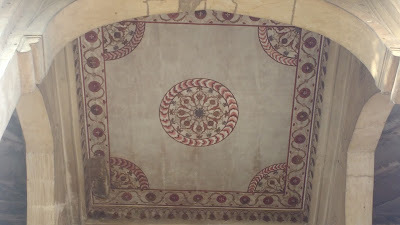 It was only during the British occupation that the artistic splendor was somewhat revealed to the world. This is another empty temple and is absolutely unadorned from the inside. On the outside though it features a very unique architectural style - almost Dravidian, but with local artistic elements. 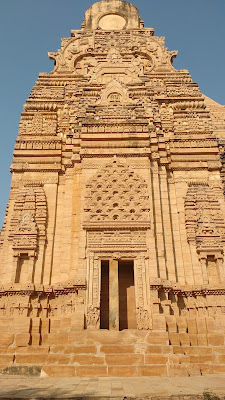 The height of this temple is about 30m and is attributed to the ninth century reign of Pratiharas. The temple takes its name from an oil-merchant (Teli) who is said to have commissioned this temple. The arched entrance to the east is a British addition. Across the Teli Mandir lies the serene Gurudwara Data Bandi. 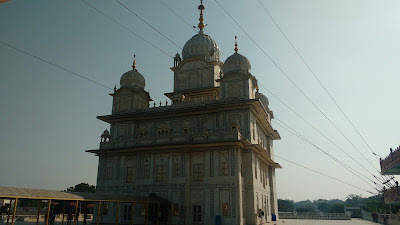 The Gurudwara is in the memory of sixth Sikh Guru - Guru Hargobind. 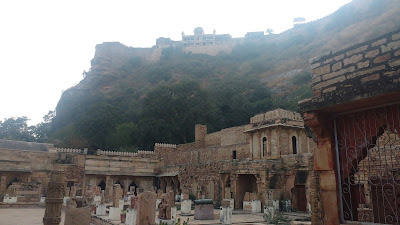 The name of the place is derived from a probable imprisonment of the Guru at this fort. 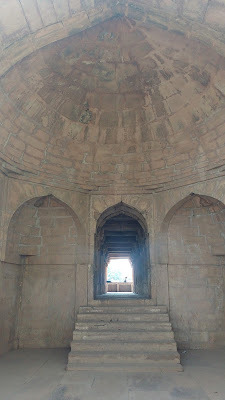 Descending from the Man Mandir Palace to the Qila Gate one comes across this small Vishnu Temple. The temple is non-descript except for an inscription along one of its walls that is known to be the oldest description of a zero. 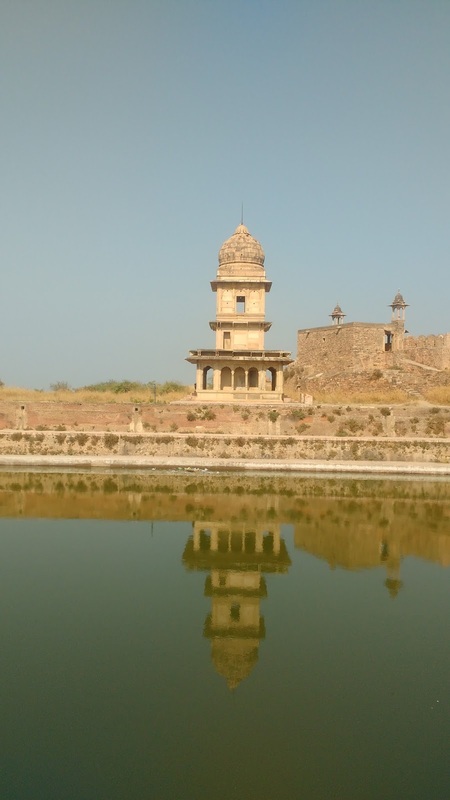 This small palace was constructed just next to the Qila Gate by Man Singh Tomar for his favourite Queen, Mrignaini. 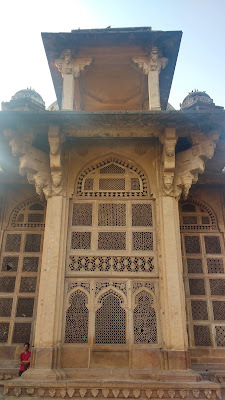 The Queen belonged to the Gurjar caste and hence the name - Gujari Mahal. Watch out for elephants on windows of the upper storeys. The palace has now been converted into a museum managed by the state authority and has some very interesting figures. The principal among these is the Shalbhanjika which is displayed only on requests. The museum has a separate ticket. A little away to the east from the Qila Gate, one comes to this simple complex of the dargah of the sufi saint Mohammad Ghaus in the Hazira Chowk area. 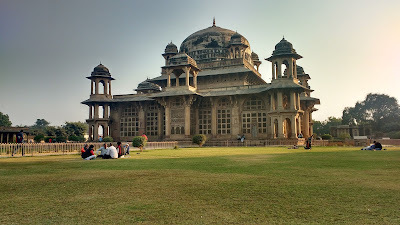 The stupendous building is surrounded by a garden on the northern half and smaller dargahs and tombs on the southern half. The garden is a wonderful place to relax for a while after the excursion up on the fort. 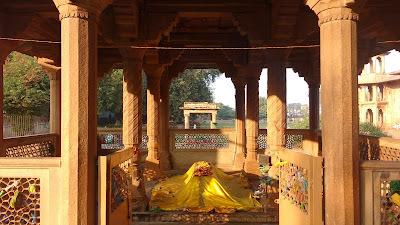 One can also pay obeisance to the legendary Tansen whose tomb is also placed in this compound. 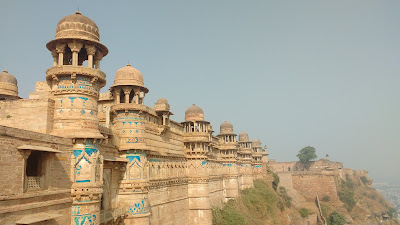 There are quite a few places to see in Gwalior city other than the fort too. 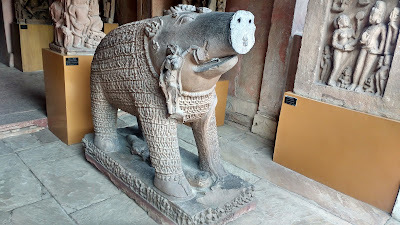 These include the Jai Vilas Palace modeled after the Palace in Versailles (France), Scindia Chhatris, Sun Temple, Memorial of Rani Laxmibai, the Narrow-Gauge Railway and a few more. 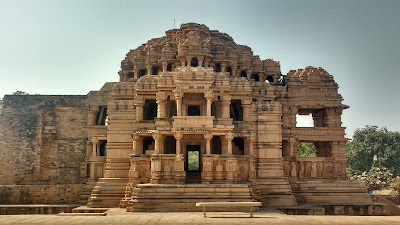 These places would warrant that a visitor to Gwalior stay here for another day at minimum. 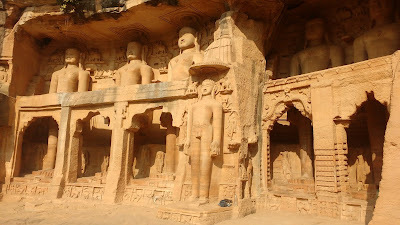 A mask for your nose, a pair of earbuds and you'd be well on your way to enjoy these sights of Gwalior too! Very impressive works! I hope I get to see this some day! Wonderful pictures. This Fort is simply awesome. Wow ! So beautiful place !! Possibly will be there in this December .